Japan is renowned for its cherry blossoms, with destinations throughout the country igniting in soft pinks and whites when spring rolls around. But have you ever wondered which are the top-visited ohanami sites? In this article, we’ll share with you the destinations that ranked highest in terms of official visitor numbers, as well as a few popular spots whose numbers are not disclosed. In addition, please see the following sites for details of cherry blossom viewing spots in Kyoto and Tokyo. One of Japan’s oldest public parks, Ueno Park is home to around 1,200 cherry blossom trees and is the top cherry blossom viewing spot in the country. People come to lay out mats beneath the trees, enjoy a picnic and drink sake while admiring the stunning blooms. It’s easily accessed from Ueno Station and situated just across the street from the Park Exit. While Hirosaki Park is famed for its Edo-built Castle Tower, it’s also home to around 2,600 cherry blossom trees in 50 different varieties. Understandably, it’s an incredibly popular ohanami destination, with highlights including the Sakura Tunnel on the west moat and seeing the trees illuminated at night. Hirosaki Park is a 15-minute bus ride from Hirosaki Station along the Dotemachi Loop Bus. Sprawling across 58 hectares, Shinjuku Gyoen is a famous garden and green oasis in the heart of Shinjuku. It’s planted with around 1,000 cherry trees in numerous varieties, meaning you can see blossoms either early or late in the season. 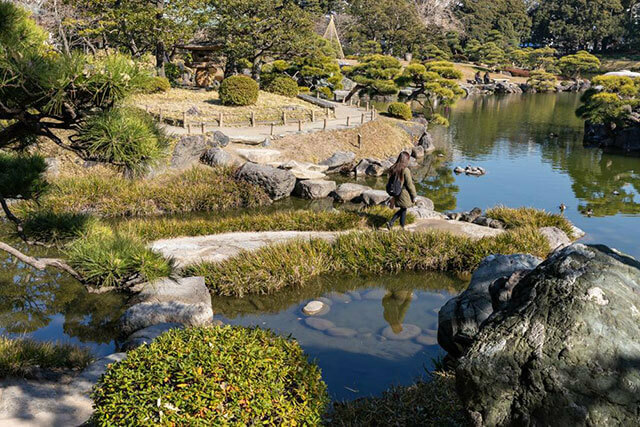 Aside from its traditional Japanese garden, Shinjuku Gyoen is also home to a former French garden and an English landscaped garden with lawns that are ideal for picnicking. Shinjuku Gyoen is just 10 minutes’ walk from Shinjuku Station’s South Exit or five minutes from Shinjuku-Sanchome Station. Built in 1614 by Matsudaira Tadateru, Takada Castle is surrounded by more than 4,000 cherry trees and a 300-meter-long pedestrian walkway that’s known as “Sakura Road”. It’s renowned for its nighttime scene when the trees are magically illuminated by lanterns and hundreds of stalls selling food and drinks set up in the surrounds. The park is a 15-minute walk from Takada Station. Centered around three ponds and a Korean Garden, Mitsuike Park sprawls across 30 hectares in Yokohama. Its home to 1,600 cherry trees of 78 different species that break out in blossoms during the spring, with the first trees to bloom being the kanzakura. The park is a 20-minute taxi ride from Yokohama Station. The Osaka Mint Bureau is famed for its yaezakura cherry trees, which blossom slightly later and with more petals than the classic somei yoshino variety. For one week each April, the bureau opens its grounds for people to enjoy Sakura Torinuke, with their cherry trees also illuminated at night. It’s just a 15-minute walk from Temmabashi Station. Situated in the Kichijoji area of western Tokyo, Inokashira Park is home to around 500 cherry trees, many of which are planted around its central pond. Some of the varieties are late blooming, with the fallen petals turning the waters a beautiful pink color. You can rent a boat and paddle across the pond or see the cherry blossoms illuminated at night. The park is a five-minute walk from Kichijoji Station. Home to the castle where Tokugawa Ieyasu was born, Okazaki Park features around 800 cherry blossom trees that line the Oto and Iga rivers. During the annual Sakura Festival, numerous food and drink vendors set up to create a bustling atmosphere. The cherry blossoms are illuminated by lanterns and, together with the white Okazaki Castle Tower, create a magnificent scene. The park is around 10 minutes’ walk from Higashi-Okazaki Station. One of the main tourist attractions in Hakodate, Fort Goryokaku is a star-shaped, Western-style fortress that was built during the late Edo Period. It’s also one of the most popular cherry blossom viewing spots on Hokkaido, with the season arriving a few weeks later than mainland Japan. Around 1,600 trees line the fort’s moats where you can rent boats, then soak up the views from the 100-meter-tall Goryokaku Tower. Catch the tram from Hakodate Station to Goryokaku Koen Mae Station and the fort is just 10 minutes’ walk away. 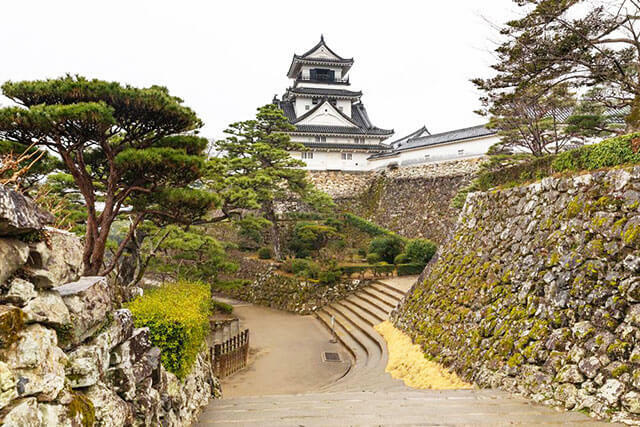 Although only its inner moat and stone walls remain, the Morioka Castle is considered one of Japan’s 100 Great Castles and was once home to the Nanbu Clan. It’s planted with numerous cherry trees that flower spectacularly during the spring, with locals coming to picnic under their blossoms. The Morioka Castle Site Park is just 20 minutes on foot from Morioka Station. With cherry blossom trees lining its banks, the Meguro River is one of Tokyo’s most popular cherry blossom viewing destinations. Around 800 trees extend almost four kilometers along the river, making it the perfect place to stroll, shop or relax at one of the many cafes. A cherry blossom festival coincides with the full bloom, although the end of the season when the petals are falling into the river is also magical. The Meguro River is 10 minutes’ walk from the Meguro Station or five minutes from the Nakameguro subway station. An oasis in the city, Yoyogi Park is one of the largest urban parks in Tokyo and a popular hanami destination. Around 700 cherry trees are planted in the park, with people arriving early in the morning during the cherry blossom season to reserve a picnic spot beneath the trees and relax with family and friends. It’s just five minutes’ walk from Harajuku Station. For spectacular views of cherry blossoms with Mount Fuji, head to the shores of Lake Kawaguchi where around 300 cherry trees are planted. It’s a popular place to capture photographs of Mount Fuji reflected in the waters, particularly during the Sakura Matsuri, Fuji Kawaguchiko Cherry Blossom Festival. The lake is around 25 minutes by bus from Kawaguchiko Station. Designated as a National Treasure of Japan, Matsumoto Castle is a deservedly popular tourist attraction in its own right. But during the cherry blossom season, it attracts visitors for another reason as its 300 cherry trees come into flower. It’s a stunning sight to see the castle’s black-and-white architecture with the soft pinks of the cherry blossoms, all just a 15-minute walk from Matsumoto Station. As one of Japan’s top three gardens, Kenrokuen is a popular destination throughout the year but particularly beautiful during the cherry blossom season. It’s planted with around 420 cherry trees in 20 different varieties, including the rare Sphaerantha cherry blossoms that have a unique shape and color that transforms throughout the season. The garden is a 20-minute ride on the Kenrokuen shuttle bus from Kanazawa Station. Sprawling across more than 100 hectares, the Osaka Castle Park is home to huge stone walls and moats, as well as around 600 cherry trees in the beautiful Nishinomaru Garden. There are 95 different varieties of Japanese apricot flowers in the park, making it one of the most popular cherry blossom viewing spots in Osaka Prefecture. It can be accessed directly from Osaka Castle Park Station. Mount Yoshino has long been one of Japan's most famous cherry blossom viewing spots, with the first trees planted along its slopes more than 1300 years ago. Today, there are around 30,000 cherry trees in numerous varieties that can be enjoyed as you ascend the mountain and explore its temples and shrines. During the season, shuttle buses connect Yoshino Station with the Naka Senbon area near Chikurin-in Temple. 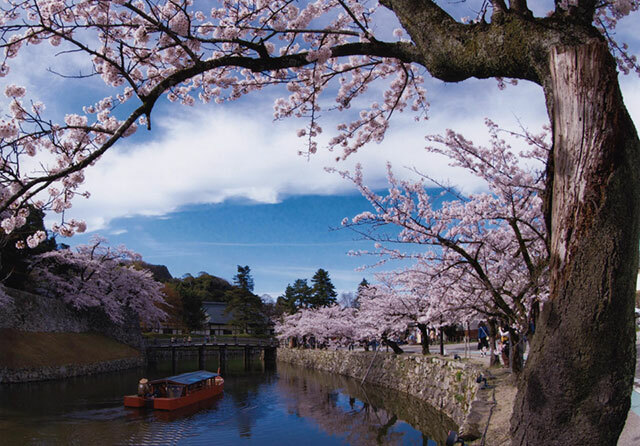 Spring is the most beautiful time to visit Hikone Castle in Shiga when around 1,200 cherry trees ignite the grounds and a festival takes place to mark the occasion. Held from 30 April to 18 May, it draws people from near and far to wander through the castle grounds by both day and night when the trees are magnificently illuminated. Hikone Castle is around 15 minutes on foot from Hikone Station. Strolling around trendy spots in Okushibu.